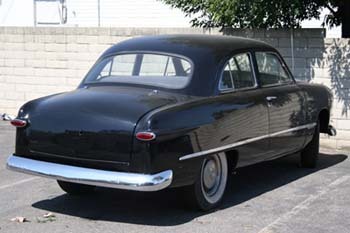 The 1949 Hillman Minx. I could'a had a V8. It was blue and had turn signals. The signals were "arms" about a foot long that flopped out of the body about window height on one side or the other to show which way you were turning; they were lit at night. Sensational. Very strange. This particular Hillman was my first car, and I'm pretty sure I was steered into it because it wouldn't go very fast. The day I got my license I put 300 miles on that underpowered British sled. It was used, quite used, worn out in fact, and it began to fall apart from day one. I can't remember how many miles were on the odometer, but it had to have turned over once. 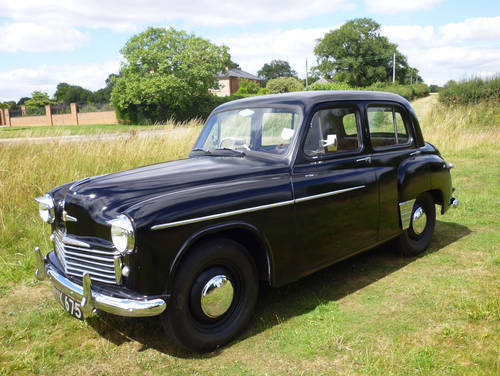 Hillmans were used as taxicabs in Great Britain, so it was probably a pretty staunch little vehicle to start with. Mine had a crank, for cold weather starts, and that was helpful but you needed someone to choke it and pump the accelerator. The thing is it was a four cylinder, and I was like, "I coulda had a V8," slap my head, but heck it was a car, it was transportation. It didn't wow girls, though I remember dating in it. I slunk through Winstead's Drive-in to the derision of the rodders. I tried to beef it up some by getting the head shaved, but didn't know English bolts turned the wrong way, so snapped off about five of the soft iron mothers trying to get the damn head off in the first place. We had to tap those bolts to get them out of the block. I learned to swear bigtime working on that crate. Okay, new head gasket on, bolts in place, torque wrench ready. All bolts finger tight. Torque 'em all at 65lbs. Next, hook up the accelerator cable. Where is it? Hmm, trace it from the accelerator, through the firewall, toward the block, up, up, oh no, must be an optical illusion. It looks like it's between the head and the block. Oh my. Oh my goodness. Rackafratzz mofronkator. Res ipsa loquitur. Okay, new gasket, polish head surface, bolts ready. Etc. Finally got the Hellman running. No that's not a misspelling. I get in to drive to school next day. Lean back in the seat. Snap! The seatback breaks in two and I'm sitting on half a seat. You can't even work the clutch or brake that way. I could go on, but it was not soon enough that a 1949 Ford flathead V8 entered my life and changed it for good. We lowered it 4" in back, pipes, cherry bombs, dechromed it, heads, cartbs, ignition, primer paint job. Here i come, Winstead's. I even got into one of those awful 50's hot rod movies. More about that some other time.